Thought you couldn't afford a fibreglass catamaran in good condition? Then think again. This delightful compact cat is perfect for coastal cruising and plenty of room for the whole family and for those regular weekends away. Echo II had a complete refit in 2005 including the removal and replacement of all deck fittings, mast and boom overhaul, new standing and running rigging, new ports and hatches, reconditioning of the engines, all new two-pack paint job and the installation of the sugar scoops and bow bulbs taking her from her original length of 32 foot to her now 34 foot. 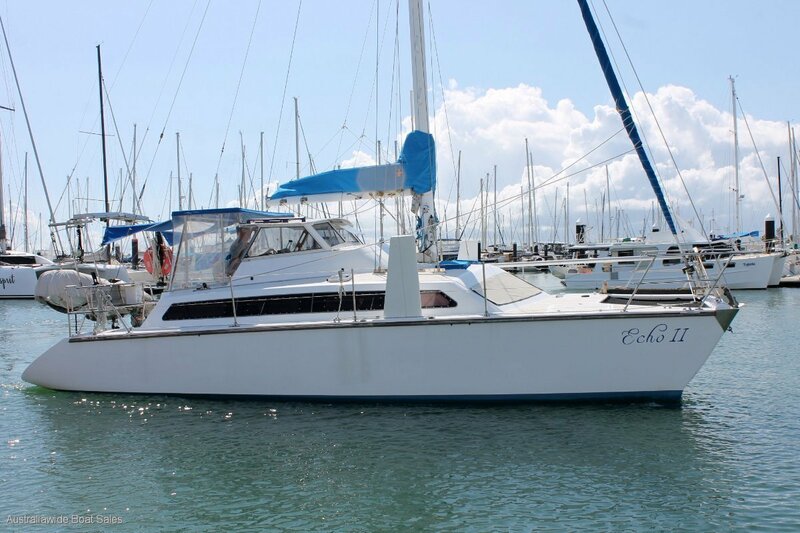 She's been lovingly cared for by her current owner is an absolute breeze to sail single handed and is an excellent buy for under $100,000. Jim Holt Boat Builders, Ballarat Vic. Integral mini keels with two vertical lifting dagger boards. Twin 7.5hp Volvo Penta sail drives swinging fixed pitch 2 blade pops. 140 litres via 2 stainless steel tanks. 500 litres via 2 integral fibreglass tanks. Two burner Smev cooktop and oven, stainless steel sink, loads of dry storage and food preparation space, Convection microwave. 12v top loading eutectic refrigerator, portable 60 litre Weaco refrigerator / freezer. Spacious saloon area with U shaped dining area, port hull contains a double berth, galley and rear cabin with single berth, whilst the starboard hull offer loads of dry storage space, dedicated navigation table, enclosed heads, and double berth. TMC electric marine toilet with holding tank. CD/MP3/AM/FM player with interior and exterior speakers. AER alloy rigid bottom inflatable. Camping covers and clears to enclose the entire cockpit. Boom bag, hatch and window covers. 18kg Manson plough anchor, 50m of chain plus additional warp to an electric horizontal capstan. 1 x manual and 2 x electric bilge pumps, fire blanket, fire extinguishers, life jackets, flares, EPIRB, danbuoy, gas detector, horse shoe float. 3 x 12v batteries, isolation switches, DC switch panel, 2 x 30watt & 1 x 40 watt solar panels, Powertech PV solar charge controller, 800 watt Powertech inverter. Navman Tracker 5430 plotter, Lowrance Elite-5m sounder, Dateline Stowe speed log, Raymarine ST40 wind displays, Coursemaster CM85i, Saturn helm compass, GME GX600 VHF & Icom IC-M700 Pro SSB/HF transceivers. Fully battened main sail, furling genoa, spinnaker, storm jib. Mast head rig with single spreaders, alloy boom and mast, twin back stays. Arco mainsheet winch, port and starboard dagger boards, fore deck lockers, sugar scoops for both hulls. Stainless swim ladder, tender davit, solid spray dodger, mast tabernacle, lazy jacks, cockpit lockers, timber transom seat, stainless mooring cleats and sampson post, fenders and mooring lines.